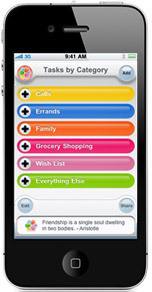 Let these iPhone apps help you get your shopping organized! Remember all your essentials, add groceries as you shop, and even find ways to save with coupons and other discounts. Grocery iQ lets you store your shopping list and all your coupons in your phone. You can also build a shopping list on the fly by scanning bar codes! GroceryList lets you choose from hundreds of built-in items or you can add your own selections. Best of all, their navigation and scanning methods make adding new foods and shopping list items fast & simple. Pushpins delivers you instant savings on your favorite products when you’re shopping in the aisle of the grocery store. The Pushpins system available in thousands of stores including Safeway, ShopRite, Carrs, Dominick’s, Genuardi’s, Vons, Pavillions, Randalls and Tom Thumb, with more on the way. SplashShopper lets you customize an unlimited number of shopping lists with your own categories, track prices, and calculate your spending in real time. 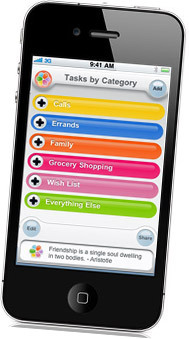 Intuition is a free app designed for busy moms manages your to-dos, ideas, appointments, Twitter & Facebook posts, and even wish lists.